Taylor Riley are delighted to announce the confirmed letting of Unit 7 at the Brunswick Industrial Estate and Unit 3 on the Brookfield Industrial Estate. Unit 7 Brunswick is a terraced workshop/warehouse consisting of 5,675 sq ft that has been successfully let to Monks Building Services on a new six year lease. 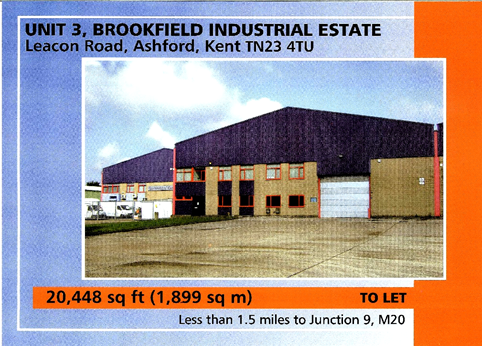 Unit 3 Brookfield forms one part of a 4 unit warehouse terrace situated on Leacon Road, Ashford. Unit 3 consists of 20,448 sq ft with access to both the front and rear of the unit. This has been successfully let to Apta Pottery on a new 5 year lease.